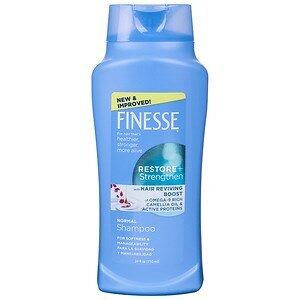 Finesse is a US based brand that manufactures shampoos to suit almost every kind of hair. They claim that by using Finesse’s self adjusting formula shampoos, you can consistently get good hair and bid goodbye to bad hair days. The self adjusting formula ensures that it gives your hair exactly what it needs – be it strength, enhancement or vitality. It consistently figures among the top 5 hair care brands. It offers clean, oil-free products which will give you great hair – sometimes with a little product and sometimes with a lot – that’s their slogan too! Let us take a look at the best finesse shampoos out there. We give you our top 5 picks here. This shampoo is meant for normal hair and comes with the self adjusting formula. It leaves the hair clean, beautifully textured, super soft and ultra manageable. The beauty of the product is that, it works even when you use a little product and if you end up using a lot, it does not weigh down your hair or cause any product build up in your scalp. If you have thin or limp hair and crave for extra volume, then try this shampoo. The Finesse volumizing shampoo has a protein formula that separates each and every strand of hair, strengthens it and gives it a volume boost. It can add almost 5 times the volume to flat hair. The shampoo contains silk and soy proteins and adds the required amount of shine to your hair as it works its magic. It has a great smell and can be used daily on the hair. If you have sensitive skin and do not want to use any shampoo with harsh chemicals, then the Finesse Clean+Simple shampoo is just made for you. It is dermatologist tested, it won’t irritate your scalp and will leave your hair clean. The shampoo is free from parabens, sulfates, allergens and dyes – so all you women looking for parabens and SLS free products, go ahead and try this! It comes in 2 variants- shampoo for normal hair and shampoo for color treated hair. 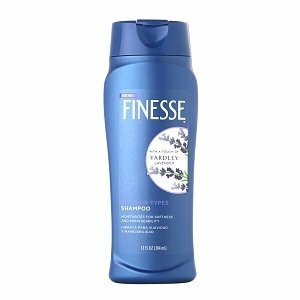 This is nothing but the regular Finesse Shampoo that is infused with a touch of the soothing scent of Yardley Lavender. It improves the softness and manageability of the hair. It has a rich lather and gives luxurious conditioning. What’s more, you are left smelling wonderful like Yardley Lavender after its use. It is suitable for all hair types. If you have colored your hair and are wary about using shampoos that may cause damage to either the hair or the color, then you should go in for Finesse Color Revitalizing shampoo. It covers the hair shaft with a coat of conditioning and shine. It revitalizes color treated hair and makes it shine. More importantly, it provides protection from the UV rays, thereby maintaining hair health and preventing the color from fading.